It’s lovely to be back in Durham just as the new academic year starts and it’s a good moment to pause and think about what I’ve been doing so far. I’ve spent the summer wandering around the country looking for books that used to belong to priests connected to the cathedral or to the cathedral library and that then ended up elsewhere. Some of these ended up where I would expect them to be- the major collections of medieval manuscripts and books, such as the British Library’s Harley and Cotton collections, or Corpus Christi College, Cambridge’s Parker Collection. These were collections put together by people looking for old books, and for the history of the English Church. Durham had really good English history- the writings of Bede and the other Northern saints and a strong historical tradition, so of course these collectors snapped up books that came from Durham originally, including most famously the Lindisfarne Gospels. Other locations of former Durham books are a bit more surprising- why are there a whole chunk of books in the Bristol Central Library or another whole chunk in York Minster Library? Well, here’s where I think it gets interesting. In 1583, a rising star of the Elizabethan Church, Tobie Matthew, became dean of Durham Cathedral. He was already a book collector, adding quite a lot to the library at Christ Church, Oxford, and was already building up his own collection of over 3000 books. Matthew stayed in Durham as dean and then as bishop until 1606, when he moved south to York as the archbishop. On his move from Durham to York, he took with him quite a few books that had originally belonged to Durham Cathedral Library, including a lovely printed copy of the Roman writer Quintilian, books of canon law, and a Psalter. Matthew also seems to have explored the bishop’s home of Auckland Castle thoroughly. 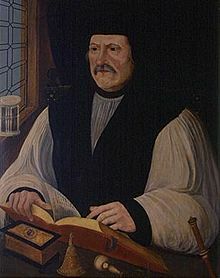 At York there are four books that were signed both by Bishop Tunstall and by Bishop Matthew. I wonder if some of Tunstall’s books had been left behind in the castle when he went south for the last time in the summer of 1558. He spent the last months of his life under house arrest in London, and his books seem to have been dispersed pretty rapidly. Some went into the Durham Cathedral collections, others have ended up all over the world (including a copy of More’s Utopia that I really want to see in the US), and Matthew ended up with at least these ones. Those are just some of the books that are associated with Matthew in York Minster’s collections today. When he died in 1628, his widow Frances gave his books to the Minster Library. However, Matthew wasn’t originally from the north of England; he was born and raised in Bristol. He was concerned that Bristol should have the books it needed to teach its children, and so he sent a large selection of his books there. 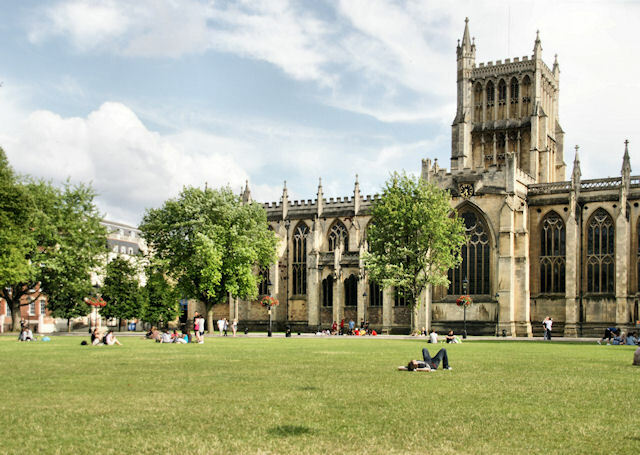 The library he helped to found in Bristol eventually became the Bristol City Library, right by the cathedral. I spent a couple of very happy days looking through the books that he gave to Bristol that he had acquired in Durham. There are a huge number of Durham Priory books that have been dispersed over the years and I’m still trying to figure out why they were taken and how they ended up in their modern locations. By looking at the books that left, I’ll be able to better understand the books that are still safely on the shelves of the library here.